Good people, great customer support. Most of you know them as an on line store but us lucky people living in the Seattle area get to go into their shop, meet with Jack and Billy and touch all the cameras, lenses, housings, lights, accessories. Great place and people. Great customer service! I'm am trying a new configuration connecting a video light to a camera tray. I need a small part to connect the two and can't seem to find what I need. Over the phone, the gentleman assisting me was going through various parts to see what might work. He made comments about what would be the most cost effective options. He also suggested that if I wanted to bring the light and tray into the shop, he would be happy to help me configure my set-up. I'm really happy I found Optical Ocean Sales! Whether you are in Seattle or not, Optical Ocean Sales has great service and prices. Great service, convenient location, and awesome selection. Really helpful to guide you to the right set up for you and your style. I ended up with far more keepers than normal. I continue to be impressed with Nauticam housings and Sony cameras, and this was without a doubt the easiest and most rewarding photo week yet! 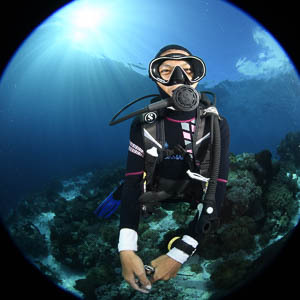 The go to place for Underwater Photography. Very helpful, and a really nice staff. I'm so excited for my upcoming trip to San Salvador with to go see some sharks! I might get to dive with a scalloped hammerhead shark! I have a complete new Nauticam photography rig, thanks to OpticalOcean--can't wait to try it out! I've ordered two camera systems and numerous accessories from them. The store is just fantastic and the staff is very knowledgeable. I have called time and time again and always with questions about purchases or asking for advice on various products and always been answered with polite, thoughtful, and helpful responses. Cannot recommend them enough!